OSWEGO, NY – Pat Lavery and Dave Gruel are no longer Novelis Supermodified teammates, but they did team up on Tuesday night to top the leaderboard during testing at Oswego Speedway. 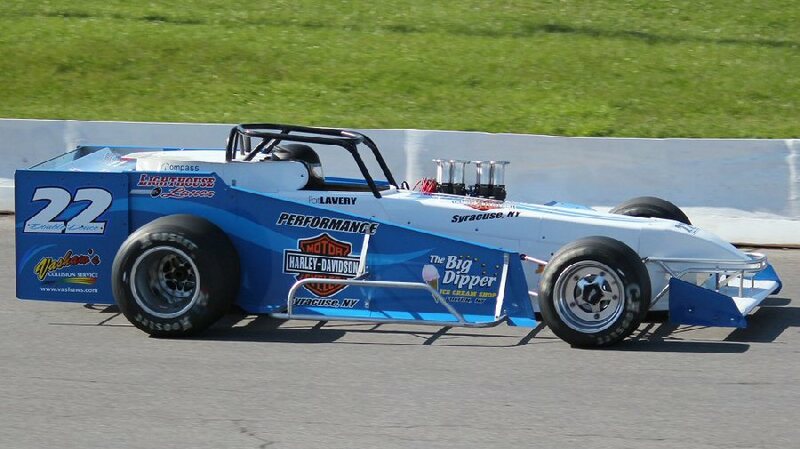 Pat Lavery continues his speed streak at Oswego Speedway in the No. 22 during testing on Tuesday night. Lavery, Gruel, Brian Sweeney, Stephen Gioia III, and Jeff Abold all took laps on the fast 5/8 mile. 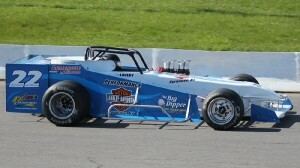 Lavery, who has turned the fastest recorded Novelis Supermodified lap at the Speedway each of the last three seasons, again showed superior speed in the Lighthouse Lanes No. 22 machine on Tuesday. After making fine adjustments on the No. 22 with older tires, Lavery later bolted on four brand new sticker tires and circled the Oswego oval in 16.574 seconds, making his lap the fastest of those to have tested so far this season in Novelis Supermodifieds. Defending Novelis Supermodified champion Otto Sitterly turned laps in the 16.6 second range during testing last Friday evening. Gruel went on track Tuesday for the first time in his brand new Hawk chassis powered by Enders Racing Engines. The all red machine took little time to show speed, quickly dipping into the 16-second bracket, eventually cranking a time of 16.754 seconds. With car builder Joe Hakwsby Jr. at this side helping to make adjustments, there is no doubt more speed will develop. Gruel, a feature winner with Double Deuce Racing and teammate Lavery in years passed, now strikes out on his own in 2014 with the Gruel Racing No. 50. Sweeney was also on hand Tuesday with the CNY CPR No. 3 mount. Sweeney, who drove to a podium finish in last season’s $10,000 to win Mr. Novelis Supermodified main, made his way into the low 17-second bracket as he continues to trim out the No. 3 in anticipation for Saturday’s opener. Gioia and Abold made their first laps on the Oswego oval Tuesday, but each ran into issues trying to get up to speed. Gioia and team were working at the back end of the No. 9 for part of the session, and later loaded up the racer before showing any real speed. The engine on the reworked Abold No. 05 was missing for much of the day, resulting in little true track time for the machine that was built brand new before 2013. On this upcoming Mother’s Day Weekend the Speedway encourages everyone in attendance to bring mom to the races as the first 250 mothers through the Speedway’s main gate will be presented with a beautiful carnation from the Speedway and Designs of Elegance. The 53rd annual Novelis Supermodified Kickoff will feature a 50-lap main event for Oswego’s showcase division as well as the season opener for the Pathfinder Bank Small Block Super division. Saturday night will mark the first opportunity for race fans to see racing action on the fast 5/8 mile oval, as the Speedway’s opening event on May 3 was washed out due to rain. Grandstand gates will open at 3 p.m. on May 10 with time trials for both divisions set to begin at 5 p.m. followed by the season’s first heat race at 6:30 p.m.
To purchase tickets for Oswego Speedway’s 53rd annual Novelis Supermodified Kickoff call the Speedway box office at (315) 342-0646. General admission seating is available for only $15, with reserved seating on sale for $20, and VIP tower seating with all you can eat food and drink for $75. Adult general admission Price Chopper Tickets to Go are available for Saturday’s event at any Price Chopper Supermarkets store for only $14. Once again in 2014, kids 16 & under will be admitted free of charge with a paid adult with active military also admitted free with I.D. For more information on Oswego Speedway visit online at www.oswegospeedway.com, follow on Twitter @OswegoSpeedway, or like on Facebook at facebook.com/OswegoSpeedway.